What is raising tringual children like? Are you planning to raise your children trilingual? Would you like to give your offspring the opportunity to speak and understand more than one language? Multilingualism for us is one of the assets we could provide to our family free of charge, but not free of effort, must admit. 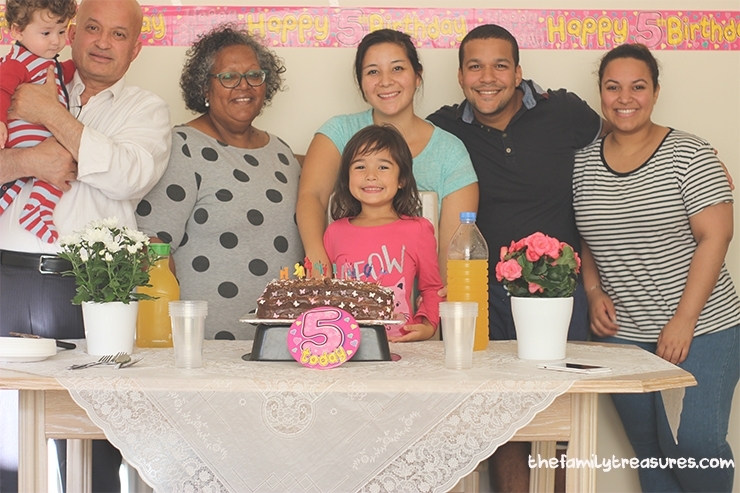 Before you start doing it you might like to read our own experience as a multilingual family. When we decided to go for it I read everything I could about the subject so in the aim of bringing some light we would like to share what is raising trilingual children like not from a professional point of view but from a family who’s living it every day. Having said this, please, keep in mind every home and situation are different but at least you’ve got one more to consider with this post. My husband is Brazilian, so Portuguese speaking, I’m Spanish speaking and we live in UK, so children, well our 5 y.old, baby is only 7 months old, speaks English as well. It wasn’t always like that though. When we first married we used to live in Barcelona, a Catalan speaking city in Spain. One thing we had decided even before getting married is that we would teach our children our own languages. Main reason of that time: so they could be able to communicate with our families. I also wanted to teach them English but since it’s not my mother tongue I wasn’t completely confident about it. 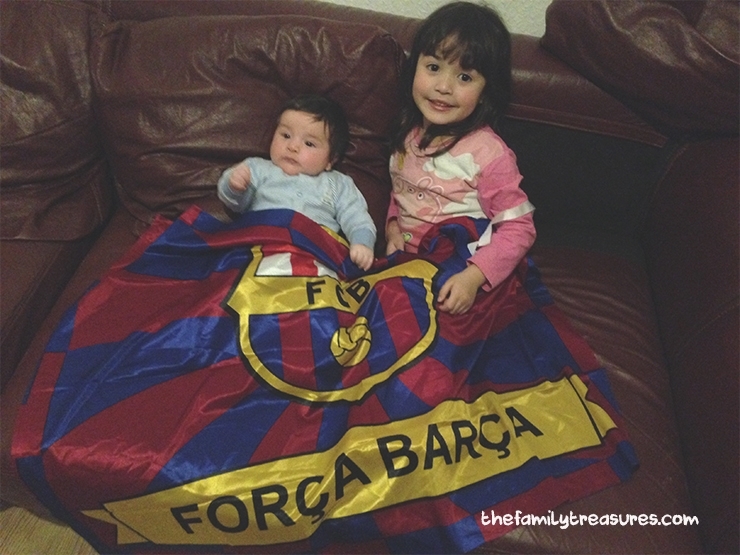 no language barrier when it comes to football…Forca Barca! When deciding what approach we would choose we came across the OPOL method. It stands for “One Parent, One Language” Each parent consistently speaks only one of the two languages to the child. We thought that, either living in Barcelona or moving to UK, it could be the one that would work best for us. Since it allowed us to communicate easily with the children. What else apart from speaking then? Reading books in your own language or translating them as you read them, travelling to visit family, regular Skype conversations with them, teaching traditions from your home country and learning the new ones from your adopted one, and most important, being consistent, at home and outside, regardless of who’s around, regardless of the situation, all those things have been part of this process and without them our child wouldn’t be able to understand the three languages and speak “almost fluent” in all 3. She just turned 5 and started school full time but before that she attended a local nursery three times a week. She still mixes them a bit but she knows what language to speak with who. Hubby and I speak Spanish with each other so I would say that it’s the dominant one but we are working on that so she can speak Portuguese with him and doesn’t reply in Spanish. She replies in English who anyone that speaks to her in that language. And now that my husband’s family live closer she is improving her fluency with them also. Our main reasons to raise them multilingual where: family and better future and job opportunities. As time has gone by I’ve come to realised that it is also a fascinating growing experience that expands their minds and makes them more aware of other cultures, other languages, different backgrounds. It opens up their understanding of the world. She wants to speak Chinese because she said “There’s a lot of people who are Chinese, and how am I going to be able to speak to them mummy?” One of her best friends is Russian and able to speak some French so they’re always trying to learn new words from each other! MUYYYY BIENNNN!!! mis chiquitines multilingues. Es perfecto q aprovecheis la oportunidad de enseñar de una forma natural….al compartir cada uno vuestro idioma. Wow I find one language hard enough! I am so impressed by this. Several studies are suggesting that multilingualism can’t be anything but good and beneficial, especially for the younger. There’s no doubt your hard work will pay you and your children good. Thank you for sharing your experience, it’s very constructive.